Coomassie dyes (also known as Coomassie Brilliant Dyes) are a family of dyes commonly used to stain proteins in sodium dodecyl sulfate and blue native polyacrylamide gel electrophoresis (SDS-PAGE and BN-PAGE, respectively) gels. The gels are soaked in dye and excess stain is then eluted with a solvent (“destaining”). This treatment allows the visualization of protein bands. The gel usually contains a set of molecular weight marker (proteins of pre-determined weight) so that protein molecular weight can be estimated in an unknown solution during the visualization. Alternatively, Coomassie may be added to undenatured protein in PAGE in place of SDS, in a technique called BN-PAGE; both SDS and CBB have the effect of imparting a net negative charge upon the proteins. Without the Coomassie, the technique is known as CN-PAGE (colorless native), and will only separate negatively-charged proteins. The original Coomassie dye was developed as a wool dye and named to commemorate the 1896 British occupation of Coommassie (now Kumasi) in Ghana. The first of the Coomassie series was Coommassie Blue R-250 (“R” standing for “reddish” and “250” being the dye strength indicator). Coommassie Blue G-250 (“G” for “greenish”) and Coomassie Violet R-150 later followed. The most commonly used dyes in the laboratory for staining PAGE gels are Coomassie Blue R-250 and G-250. Although G-250 is more sensitive, R-250 affords better resolution, and is often used instead. Brilliant Blue G (BBG) has recently been used in scientific experiments to treat spinal injuries in laboratory rats. It acts by reducing the body’s natural swelling response, which can cause neurons in the area to die of metabolic stress. Testing is still in progress to determine if this treatment can be used effectively in humans. The recent tests have administered the dye within 15 minutes of injury, but to be effective in a real-life setting, where it may take time for a patient to reach the emergency room, the treatment should be effective even when administered up to two hours after injury. The only reported side effect was that the rats turned blue. The Coomassie dyes (R-250 and G-250) are used for quantification of protein, and work by binding to proteins through Van der Waals attractions and through ionic interactions between dye sulfonic acid groups and positive protein amine groups . Coomassie R-250, is the most commonly used variant for detection of protein, allowing for detection of as little as 0.1 ug protein. The coomassie G-250 dyes is less sensitive, with a lower limit of around 0.5 µg for most proteins, but this is somewhat offset by the speed of destaining offered by this dye compared to R-250. Although R-250 is typically color invariant, Coomassie G-250 undergoes a color shift where the dye changes from dark blue black at pH 7 to a light tan below pH 2. The leuco form recovers its blue color upon binding to protein, apparently due to a neutral pH environment surrounding the the protein molecule. Consequently, a gel placed in an acidified solution of Coomassie G-250 will manifest blue protein bands on a light amber background. The bands develop rapidly and there is no need to destain, for the background color is so light as to be essentially clear. Consequently, the loss in sensitivity of G-250 can offset by the speed and convenience of the protocol, which saves up to 11 hours versus the most sensitive R-250 procedures. In addition to their use in gels, Coomassie dyes are an integral component of the Bradford Method for determining protein concentration in a solution. When Coomassie Brilliant Blue G-250 binds to proteins in acid solution, it has an absorbance shift from 465 nm to 595 nm. The absorbance data can then be used in Beer’s law to determine protein concentration and ultimately the actual amount of protein in a given solution. Gel may be prefixed in 50% MeOH, 10% HoAC, 40% H2O for 30 minutes to overnight. Stain gel in the above solution, with 0.25% Coomassie Blue R-250, for 2 – 4 hours, until the gel is a uniform blue color. Staining is complete when the gel is no longer visible in the dye solution. Prior to complete staining, the gel will appear as a lighter area against the dark staining solution. This method will detect as little as 0.1µg/band. Store gels in 7% HoAC. Fix gel in 25% IPA, 10% HoAC in water, 30 – 60 minutes. Stain gel in 10% Acetic Acid in water, containing 60 mg/L of Coomassie Blue R-250. Bands will appear in 30 minutes. Allow staining to proceed until desired band intensity is reached. In this protocol, background staining is low due to the very low dye concentration used. Destain gel in 10% Acetic Acid for 2 hours or more. Store gels in 7% HoAC. To make the Coomassie Blue G-250 staining reagent, dissolve 0.2g dye in 100 ml H2O (this will require warming to approximately 50°C). Cool and add 100 ml 2N H2S04. Incubate at room temperature 3 hours to overnight, then filter. To filtered solution, CAREFULLY add 22.2 ml 10N KOH, then add 28.7g TCA. Allow to stand > 3 hours, then filter again if necessary to obtain an amber-brown solution without blue precipitate. To stain, immerse gel in above solution. Bands will begin to appear within 15 minutes. Intensity and sensitivity will continue to improve for several hours. Staining solution is stable for 2 – 3 weeks @ 25°C. 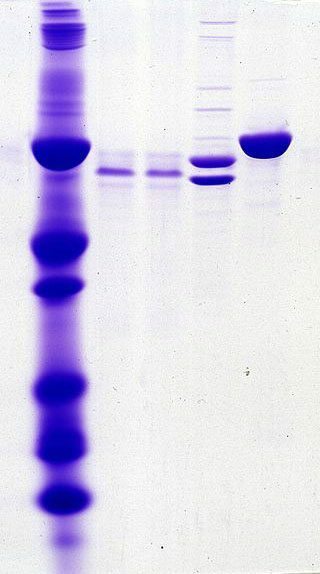 Merril CR (1990) “Gel-staining techniques” In Deutscher MP (Ed) Guide to protein purification. Methods in Enzymology volume 182. Academic press Inc.
Peng, Weiguo; Maria L. Cotrina, Xiaoning Han, Hongmei Yu, Lane Bekar, Livnat Blum, Takahiro Takano, Guo-Feng Tian, Steven A. Goldman, Maiken Nedergaard (2009-07-28). “Systemic administration of an antagonist of the ATP-sensitive receptor P2X7 improves recovery after spinal cord injury”. Proceedings of the National Academy of Sciences106 (30): 12489–12493. doi:10.1073/pnas.0902531106. http://www.pnas.org/content/106/30/12489.abstract. Retrieved 2009-08-02. Published: 7:00AM BST 28 Jul 2009 (2009-07-28). “Blue M&Ms ‘mend spinal injuries'”. Telegraph. http://www.telegraph.co.uk/science/science-news/5921266/Blue-MandMs-mend-spinal-injuries.html. Retrieved 2010-01-19. “Blue Food Dye Treats Spine Injury in Rats | Wired Science”. Wired.com. 2009-07-27. http://www.wired.com/wiredscience/2009/07/bluerats/. Retrieved 2010-01-19.